Over 110 young people enjoyed a day of activities at the Stadium of Light; they even met their footballing heroes! Working with Stoke City FC’s Community Department and Stoke-on-Trent City Council, SRtRC organised an enjoyable and educational event for young people from local Primary Schools. 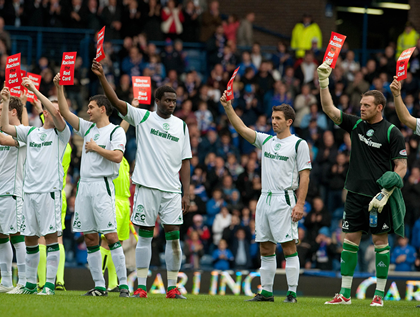 Show Bigotry the Red Card is first and foremost an anti-sectarian campaign. We aim to combat sectarian attitudes and behaviour by utilising the role model status of footballers to present an anti-sectarian message to football fans. We are intending to focus our campaign within the remits of Scottish Football and to target football fans, both on the terraces and when accessing other public spaces to watch the game. This season’s event with Cardiff City saw the launch of the Fortnight of Action 2009 and our Schools Competition for 2009-2010. Football veteran Luther Blissett is calling on the children of Kent to help tackle racism in society. Show Racism the Red Card is inviting teachers working in the North East and Yorkshire to attend a FREE regional conference entitled “Tackling Racism and promoting Race Equality” on Sunday 22nd November at the Riverside Stadium Middlesbrough. ‘Scotland United’ is a coming together of trade unionists, anti-racists, and faith groups for one purpose to hold a rally & march to celebrate multicultural Glasgow on Saturday 14th November. Show Racism the Red Card returned to Pride Park Stadium for the campaign’s second event with Derby County FC in as many seasons. P7 and Hibs want to stop Racism! Ormiston Primary visited Hibernian FC Training Centre as part of a Show Racism the Red Card / Hibernian FC anti-racist event. Hibernian FC united once again with Show Racism The Red Card to deliver an anti-racism educational seminar to local school children earlier this week. Over 50 school pupils from Ormiston Primary School and Craigmount High joined Manager, John Hughes and Hibernian stars including John Rankin, Lewis Stevenson and Kurtis Byrne for the event which aims to encourage Scotland's various communities to celebrate diversity and tackle racism. Staged for the first time at the club's Training Centre in East Lothian, the event marked the fifth major educational event to be staged by Hibernian FC in partnership with the campaign. Talking to the packed-room of young people, Manager, John Hughes, commented: "We are all fully supportive of the work of Show Racism the Red Card. I think this type of event is fantastic for young people to attend not only meet role models in football but to learn about key values in life. There is no place in football nor in society for racism, we are all equal and should treat each other with respect." Billy Singh, Campaign Manager of Show Racism The Red Card said: "We are delighted that Hibernian Football Club gave us the opportunity once again to speak to young people about racism. The campaign utilises the role model status of football players to deliver the anti-racist message and I'm sure the presence of the first team players and the Manger talking about racism will have a lasting impact on the young people." The event included a screening of the Show Racism The Red Card Scotland film and a Q&A session on racism with the young attendees and the panel made up of Hibernian and the Show Racism The Red Card representatives. The anti-racist educational film was launched at Hampden Stadium earlier this year and includes interviews with Hibernian striker Abdessalam Benjelloun alongside Julie Fleeting, Thierry Henry, Rio Ferdinand and Ryan Giggs. A Hibernian FC spokesperson, added: "The Club continues to fully support the aims and objectives of the Show Racism the Red Card campaign. Education is the key to eradicating racism in the long term and we hope that our continued support and activity will go some way towards influencing attitudes in young people in a positive way." A total of 100 school children join MSPs and Dundee United players at anti-racism seminar.